The Burlington School Board went back to the drawing board Tuesday night, one week after residents repudiated a budget proposal that would have increased taxes by nearly 10 percent. It’s been more than a decade since Burlington voters struck down a school budget. As board members tried to sort out their options, it was clear they find themselves in unfamiliar territory. At times, they sounded like political strategists, analyzing vote counts in various wards. At others, they sounded like marketers, discussing how best to “sell” Budget 2.0. Throughout, they sounded like people backed into an uncomfortable place. Under the city charter, the board can either put another budget proposal before voters in a special election or simply revert to the current year’s budget. If it's the latter, officials will need to cut $1.5 million from the $67 million budget they initially requested for the 2015 fiscal year, which begins July 1. The board hasn’t decided which route to take. Several members argued for adopting the default budget, saying it would be futile for them to devote the time and money to creating a new budget that could also get shot down. Board Chair Alan Matson said would cost about $30,000 to hold a special election. “That divorces us from the challenging decisions of deciding not just what to cut but how much,” she added. 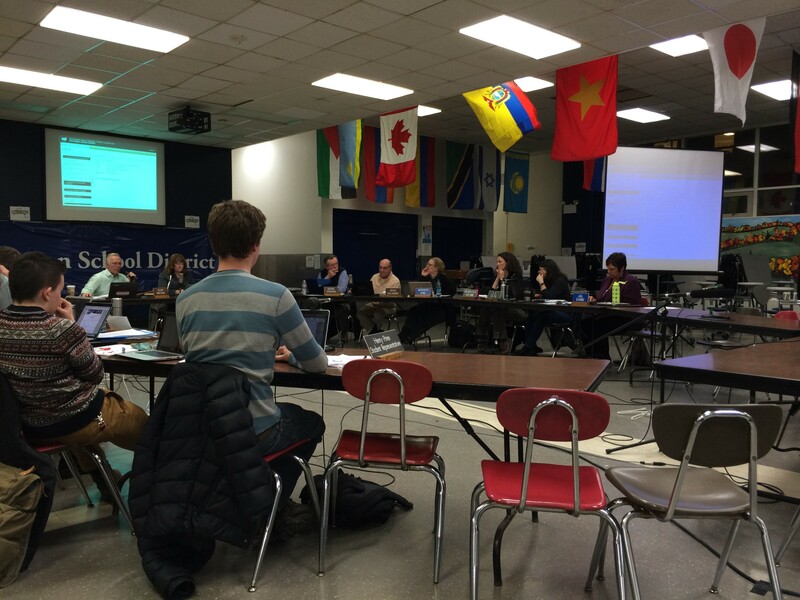 Board members didn’t discuss possible cuts Tuesday. But the cogs are starting to turn on that front: Superintendent Jeanne Collins is starting on what she referred to as a “reduction in force” or RIF list, identifying positions for possible elimination. Collins said she is meeting with the teachers union Wednesday and will deliver the list to the board before the end of the month. The Town Meeting Day results upended business as usual on the board in another way; Residents also voted out all three of the incumbents who sought reelection. Three more board members opted not to run again. The new board — six of the 14 voting members are newcomers — takes over in April, but there’s too little time for a lame duck period: a new budget proposal must be finalized by May 10. Three of the new members joined the discussion Tuesday. Brian Cina (Ward 7) told the current board that it should offer more transparency to voters. “We need to explain to people where the money is going,” Cina said. Fifty-five percent of voters — 4,118 people — rejected the school budget, which represented a four percent increase in spending. But by the time the topic turned to the budget at Tuesday’s meeting, only nine members of the public sat in the audience, and three of them were reporters. The budget discussion will continue this Thursday when the board’s finance committee convenes.